The Monongahela Cemetery offers a large selection of Memorial Products including monuments, headstones, benches, bronze markers, and vases. The Memorial Products we offer will leave a lasting tribute to your loved one. Made using the highest grade of craftsmanship and materials, we ensure that the monument you select will stand the test of time. Our staff is caring and considerate to your needs and will assist you in selecting a Memorial Product that will honor your family member for ages to come. We will be by your side throughout the entire process and help you select a product that best memorializes your loved one. To further enhance the Memorial Product you select, we also offer etching and sandblasting services to create a strong visual impact. Etchings are applied by artists to the polished surface of the granite using lasers or hand engraving. This process allows for a completely custom design element, such as photos and illustrations, to be incorporated into the Memorial, creating a personalized and memorable tribute to your loved one. 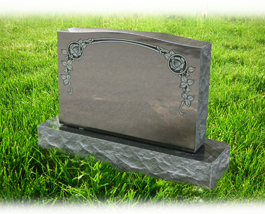 Sandblasting is another process that can enhance the appearance of your Memorial Product. This process allows you to include various designs and lettering in the granite. Pre-arrangement is a noble act that eases the burden on your family. Making decisions in advance about your own Memorial Products allows them to focus on seeking comfort and closure during a difficult time. Pre-arrangement of your Memorial Products will also ensure that your wishes are carried out exactly as you like, which avoids confusion for your loved ones. In doing so, this allows you to purchase and install your Memorial Product at current costs, safe-guarding you from inflation or unforeseen price adjustments. We will help you in all of your pre-need planning to ensure that the Memorial you select meets your exact specifications.